This was the second all live-action film made by Walt Disney – and again made in England at Denham Film Studios and it is my own favourite film. My very first post on this Blog covered Treasure Island – a first for Disney – and as the year 2012 closes we concentrate on this one. As films go this is about as good as it gets. It is a superb film in all respects. 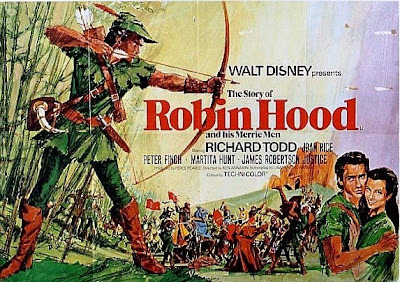 Following Treasure Island Walt Disney decided to make The Story of Robin Hood and carefully chose the leading actors himself – certainly Richard Todd and Joan Rice were his preference – and he was right. They were VERY good. 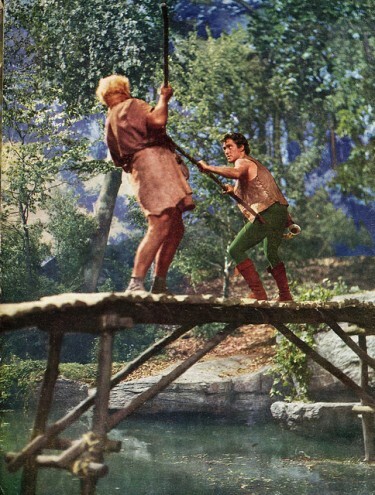 The story is beautifully told and tells of Robin Hood becoming an outlaw after his father is murdered and the now famous meeting with the ‘ Merrie Men ‘ then to a thrilling climax in the castle with Robin locked in combat with the Sheriff of Nottingham – brilliantly played by Peter Finch – in the role that would kick start his career. Richard Todd plays a youthful Robin Hood – and plays him well with just the right balance of action and romanticism whilst Joan Rice takes her big chance with this role and is excellent – and she really looks the part and to my mind is unrivalled in this portrayal. James Robertson Justice fits the bill as Little John and James Hayter nearly steals the show with his portrayal of Friar Tuck. Also Elton Hayes as Alan A’Dale is perfect and links many of the scenes with his minstrel songs. Martita Hunt who a few years earlier had played Miss Havisham, is here cast as Queen Eleanor – mother of Richard and Prince John. On top of this we have Hubert Gregg as a brilliant Prince John with Peter Finch as mentioned earlier as the Sheriff of Nottingham. Here are four of the main characters Left to Right Elton Hayes, Richard Todd, Joan Rice and James Hayter – above. 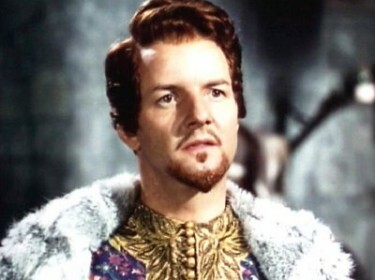 This shot of Hubert Gregg as Prince John – above – just seems to capture the style of how he played the the part. The Director of the film was Ken Annakin and this was his big break in films although he had directed British films such as The Huggets and Quartet – so he was by no means unknown. He did a great job on this film. Walt Disney appointed Carmen Dillon as Art Director who he got on well with and who he trusted and I have to say her set design on this was just wonderful. Some of the studio forest scenes and the enormous Robin Hood camp set she built were incredible. It is a good job this film was made at Denham because there she had the room to do what she wanted. Another person who we have posted on before on this Blog was Peter Ellenshaw Matte Artist genius who painted in some great matte backgrounds. Ken Annakin thought this process was wonderful and enabled the film to have such a big scale look. Guy Green was in charge of the colour photography. These are all names that belong in a Film Greats List if such a thing exists. Robin meets Little John – the famous quarter staff fight on the bridge. Again a wonderful studio set from Carmen Dillon but it was just so real. There you will see about six years of considerable effort by Tony who has produced it – others like myself have contributed and we have together found out so much – as you will read. Now I really am cheating a bit here ( again) because this film was made in 1946. However my recollection of it was a film in the fifties shown on Television around Christmas time – and what better film to show at Christmas ! So I have decided to bring it to the Filmsofthefifties Blog here. George Bailey (James Stewart), Mary Bailey (Donna Reed) and their youngest daughter Zuzu (Karolyn Grimes). 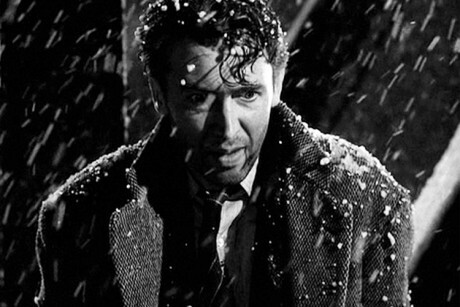 James Stewart stars and gives the acting peformance of his life as George Bailey a young man who dreams of travelling the world but somehow never does and he stays in Bedford Falls, marries and raises a family devoting his life to working for the benefit of his many friends in the town through difficult times. However misfortune befalls him and he is faced with despair and ruin. He contemplates taking his own life but a guardian angel in the unlikely guise of Henry Travers visits him and shows him how life would have been had he never been born. He pleads to be given a second chance and finds out how much he is loved and valued. It is a truly great story with James Stewart’s performance as George Bailey absolutley magnificent – and one that will live in the memory. His wife is played by the lovely Donna Reed who I feel never got a part as good as this one again although she had a long career. The cast reads like a whos-who of Hollywood actors with H.B.Warner, Beulah Bondi, Henry Travers, Lionel Barrymore, Thomas Mitchell, Frank Faylen, Gloria Grahame and Ward Bond among many others. James Stewart and Donna Reed – above. The scene where James Stewart prays on the bridge and in an anguished prayer asks God to ‘Let me live again’ must rank as one of the most tear jerking moments on film but it is the culmination of the build up to the ruin he faces and his misjudged perception of letting down his friends and family. He is of course saved and surrounded by his loved ones and his family realises that he truly has a Wonderful Life. The last moments of the film are filled with joy and happiness. 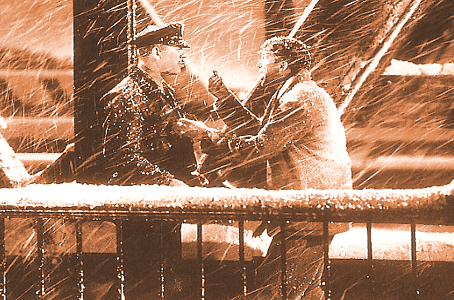 Above – George Bailey with his friend played by Ward Bond – After the famous ‘Let Me Live Again’ prayer. It’s a Wonderful Life was shot at the RKO Studio in Culver City, California, and the 89 acre RKO Radio ranch in Encino, where “Bedford Falls” consisted of Art Director Max Ree’s Oscar winning sets originally designed for the 1931 epic film Cimarron that covered 4 acres , with a main street stretching 300 yards, stores and buildings, and a residential neighbourhood. Capra built a working bank set, added a tree-lined centre parkway, and planted 20 full grown oak trees to existing sets. Pigeons, cats, and dogs were allowed to roam the mammoth set in order to give the “town” a lived-in feel. Due to the requirement to film in different seasons, the set was made extremely adaptable. RKO created “chemical snow” for the film, made up of crushed cornflakes. Filming started on April 15, 1946 and ended on July 27, 1946, exactly on deadline for the 90-day filming schedule. RKO’s movie ranch a filming location of “Bedford Falls”, was demolished in 1954. There are only two surviving locations from the film. The first is the swimming pool that was unveiled during the famous dance scene where George courts Mary. It is located in the gymnasium at Beverly Hills High School and is still in operation as of 2008. The second is the “Martini home”, at 4587 Viro Road in Flintridge, California. 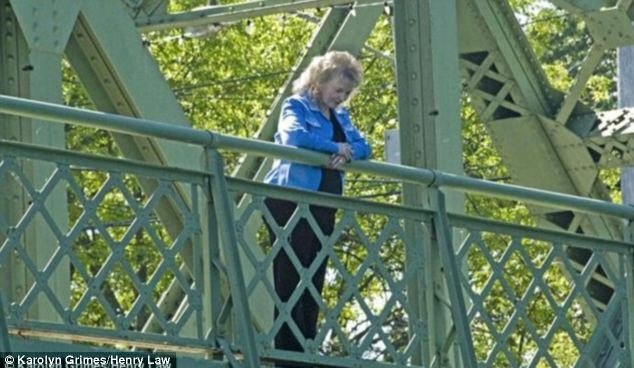 Above Karolyn Grimes – who played Zuzu in the film visits the town which it is said Frank Capra based Bedford Falls on – the town of Seneca Falls i New York State. Sixty-five years ago Bedford Falls was the talk of the town as the setting for Christmas classic ‘It’s a Wonderful Life’. Residents from the New York village say it served as director Frank Capra’s inspiration for the design of the famous fictional town. Karolyn Grimes who starred as six-year-old Zuzu in the 1946 movie visited Seneca falls last year – see above picture. The actress divorced and her former husband was killed in a hunting accident. She married again, and her son committed suicide and second husband died of cancer. She made a few films up until 1952. Her Hollywood career ended with her parents’ deaths when she was a teenager. She was then sent to live with her aunt. She eventually became a medical technician. One of her most vivid memories of filming “It’s a Wonderful Life” was the large Christmas tree in the Bailey house. Karolyn’s’ own family had a two-foot-tall tree that stood on a table. She also said that she enjoyed the snow on the set, even thought it was artificial, because she had never seen real snow. She still has an angel ornament from the Christmas tree in the film. Wouldn’t it be dreamland to be able to visit Bedford Falls and have a good look around the place that is so familiar to us – but none of us has ever been. I think if we offered excursions they we would be ‘fully booked’ continuously particularly at this time of year. 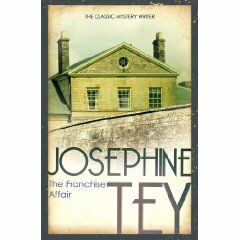 The 1951 film was based on the Josephine Tey novel – recently voted by the Crime Writer’s Association as one of the Top 100 Crime Novels of All Time. 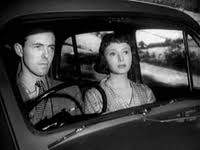 THE FRANCHISE AFFAIR – 1951 UK Michael Denison is a small town solicitor ( lawyer) who gets himself involved in a suspected kidnapping. Dulice Gray is a woman who along with her mother is accused of grabbing a local teenager and forcing her to become a maid. She hires Denison to prove her innocence. Very soon rocks are coming through the window and threats are coming thick and fast. Not as silly as it might sound – the film was directed by Laurence Huntington. The film was made in moody black and white. . The story was updated by author Jopsephine Tey to the late forties and the film presents pleasant views of English village life at that time. The script is extremely well-written. As in films of this era and type, there is a great deal of dialogue whereas today both in TV , films and maybe in life itself, people do not seem to converse to the same extent - I dont know why really. The acting is, as always with films made in the golden years of British film making, is good. 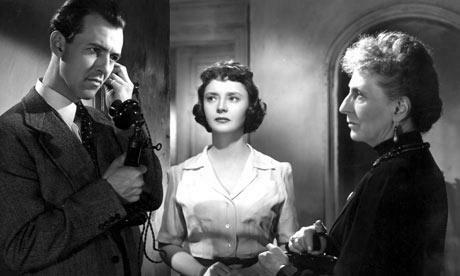 There are also a number of future British film stars in small roles here including Kenneth More, Patrick Troughton and Jean Anderson and there is a delightfully dotty performance from Athene Seyler as the lawyer’s mother. Such witty and well-judged performances like those are always worth a look. A true oddity. A novel that always shows up on various lists of the greatest mystery novels ever written, but it’s hardly a mystery at all. It’s loosely based on the true story of Elizabeth Canning, and it has a mystery premise: a young woman named Betty Kane accuses two spinster women, a mother and daughter, of kidnapping her in order to turn her into their maid. She claims that when she refused they kept her in an attic room and beat her. The story is narrated by the mild-mannered solicitor hired to defend Marion Sharpe and her mother- the two women accused. Josephine Tey was, in reality, the Scottish writer Elizabeth Mackintosh, who wrote just eight mysteries under her pseudonym. What makes her truly stand out from other writers during the golden age of the mystery novel is how unorthodox she was as a plotter; some of her mystery novels barely qualify as mysteries at all, including this one, for the simple reason that it is made clear early on who is telling the truth and who isn’t. The suspense comes from wondering if the innocent will triumph in the end. The film was made at Welwyn / Elstree Studios, Borehamwood in Hertfordshire, England. – The last film made here see below. The story opens in a solicitor’s office in a quiet country town. The scene is set perfectly. Robert Blair’s usual business is conveyancing, wills and investments but, just as he is rising to leave the office, he receives a telephone call that will lead him to a very different case. He is summoned to The Franchise, a large house behind a high wall on the edge of town. Marion Sharpe lives there with her mother in genteel poverty. The story he hears there is extraordinary. Betty Kane had just left school. One day, she says, she missed the bus home from town. She accepted a lift from two ladies in a car. And those two women kidnapped her and kept her prisoner to act as their servant. Because they couldn’t find anybody willing to work in their big house on the edge of town. She was locked up, beaten and kept hungry to make her comply. Finally she found a locked door and made her escape. Betty Kane describes the Sharpes, their car, details of their home perfectly. They are astounded, and insist that they have never seen the girl before. Robert believes them. But how does she know so much. How can he prove that she wasn’t there? So begins an extraordinary mystery. A crime without a body, without a single drop of blood shed. Little facts emerge and a picture builds and changes. Progress is slow, and yet a fairly unremarkable country solicitor holds the attention. Why? Well Josephine Tey can certainly write. All of her characters are distinctive beautifully drawn, her story-telling is assured, her plotting is clever, and she paints a clear picture of a time and place. The social changes that followed the war are illuminated. The tabloid press take a keen interest. And their neighbours are eager that the women that they perceive to be wicked criminals are punished. There is much food for thought, with every element judged and balanced perfectly. The story culminates in a brilliant court room scene. The truth is revealed. It was the right conclusion to a wonderful story. Micahel Denison had a long career in Film and Theatre and also a good long marriage to Dulcie Gray. They very often appeared together and may be better known to TV audiences for their appearance in Howards Way in the late 80s. Michael and Dulcie 1956 – above Studying a script. The final productions made at Welwyn in 1950 were the comedy Talk of a Million (1951) and The Franchise Affair (1951), which starred husband-and-wife team Dulcie Gray and Michael Denison. ABPC sold the site shortly afterwards bringing to an end the three-stage studios that had produced over 70 films, and tobacco company Ardath took over the premises in late 1951. The premises were shortly after used as warehouses by DIY manufacturers Polycell. Supermarket giant Tesco cleared the site in 2007. Now this one is definitely among my VERY favourite films – a comedy thriller with the magnificent Alistair Sim with all his incredible facial expressions at his very best and among a crowd of now famous character actors from British Films at that time. This is a film that used to crop up on TV in England on a regular basis but I haven’t seen it for ages. Alastair Sim plays a retired assassin who has been hired to do one more job. He plays Hawkins who had been involved years before in espionage (we assume) but had retired at the end of WWII. However now he is hired to eliminate Sir Gregory Upshott – a pompous minister played by Raymond Huntley - before he leaves for the Middle East. In the process Hawkins romances Upshott’s secretary Marigold to find out his schedule and she tells him that Upshott is going to the Green Man Hotel with one of the office girls under an asssumed name. However when he was making notes he didn’t see a piece of carbon paper under his sheet. Marigold finds the carbon copy and rings Hawkins asking why he was so interested in her boss – the government minister. She insists on coming over for an explanation. Hawkins sends his assistant next door and he switches house names so that Marigold will go to the wrong place which she does and the assistant murders her. Stumbling into this situation comes William Blake (George Cole), a vacuum cleaner salesman – I always remember he was trying to sell ‘the little wizard of the carpet’. He had made an appointment with Hawkins housekeeper. and since the house names were changed he thinks he’s in the right place. He dumps soot on the carpet for the demonstration but there is a problem here – no electricity. Blake is left alone until Ann Vincent (Jill Adams) comes in. The house belongs to her fiancee, a BBC radio announcer. The two are due to get married and the house is empty and waiting for them to set it up. George Cole meets Jill Adams – but it is not what it looks like !! Her fiance comes by and catches the two hiding under the bed. Reginald the fiance played by that wonderful character actor Colin Gordon, doesn’t believe why they are hiding and becomes angy and storms out. Blake then discovers Marigold’s body in the piano. It all comes to a climax at the Green Man – a cliff to hotel somewhere in the South of England. 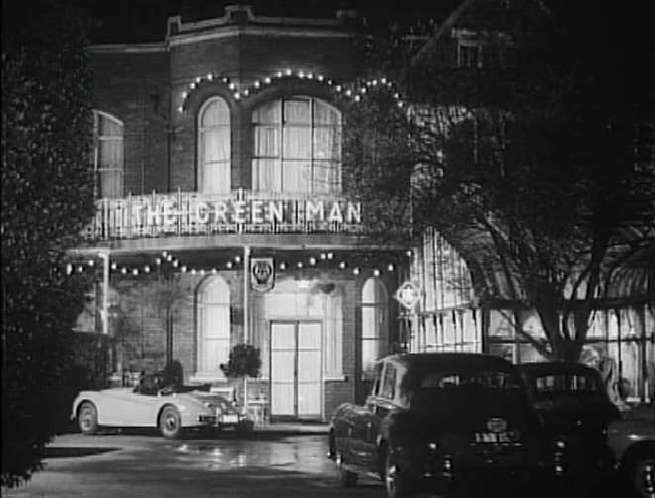 The Thrilling Climax of the film takes place here – at The Green Man Hotel. – above. Sidney Gilliat and Frank Launder were up for the BAFTA award for Best British Screenplay. Great performance from Alistair Sim surely Britains greatest actor (well I think so), with all round good performances from the rest of the cast. The film is farcical in the best tradition of British farce but all good clean innocent fun really. Above all it is truly funny and it contains one of the best lines in British film comedy. When the character Reginald Willoughby-Cruft ( the brilliant Colin Gordon) confronts William Blake (George Cole) and says, “by heaven I’d thrash the life out of you, if I didn’t have to read the 9 o’clock news.” How much more British can you get !! This is a very good film with a good script, terrific acting from Victor Mature and Diana Dors and beautiful wide-screen photography. A work colleague of mine who is not at all a film fan really likes this one because it centres on the old vehicles which seem to have such a nostalgic pull for some people and I suppose shows a world gone by. These are two very good actors – both often underrated and in my book wrongly so. 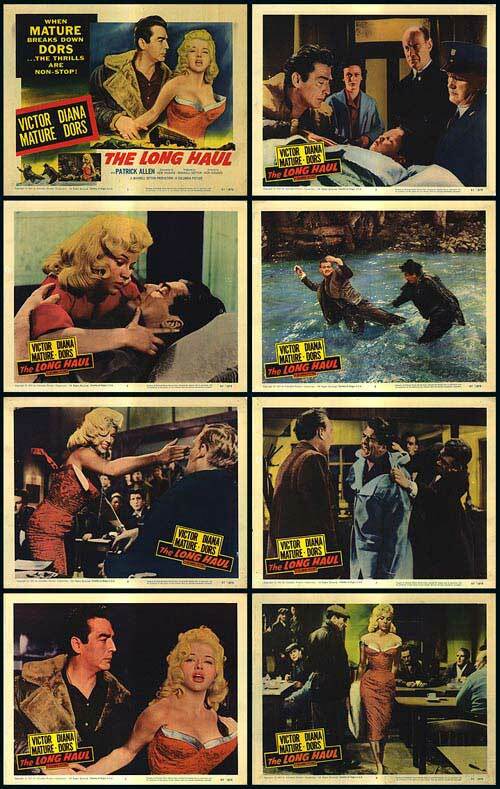 Diana Dors is particularly good in this role displaying great sensitivity and Victor Mature plays his part well. The relationship between the principal characters is very well drawn and the outcome is not the normal ending that one would expect For a film made in England in the mid fifties the production values are high and they seemed to have spent some money on this one. One scene where Victor Mature changes the front wheel of his truck under 5 foot of water in a Scottish loch has to be seen to be believed - I wonder how many truckers could equal Victor Mature’s prowess in this area ! !This is much more than just a movie about truckers although fans of trucks will be able to see the Leyland Octopus 8 wheel truck in action.The Long Haul is a good film of it’s day. It is available on DVD now I understand. Marilyn – Before She became famous ! When the former Norma Jeane Mortenson teamed up with pinup photographer Earl Moran as a model in the 1940s, the result was nothing short of stunning. At the time, Marilyn Monroe was a model for Blue Book Modeling Agency, and was paid 10 dollars an hour for the shoot. The images are being displayed in Minneapolis. It was probable that this photo shoot helped her into films. In 1946, Earl Moran moved to Hollywood though having already painted many movie stars and soon after his arrival, he interviewed a young starlet named Norma Jean Dougherty who wanted to model for him. For the next four years, Marilyn Monroe posed for Moran and the two became friends. She always credited him with making her legs look better than they were as she felt they were too thin. Moran’s work during this time period is now his most valuable; a Moran Marilyn pastel sold for $83,650 in 2011 nearly doubling the previous record for one of his works. Mainly for the reason that I like the storyline, this must be my favourite Tarzan film – and there are a lot of them. In this one Lex Barker takes over the main role from Johnny Weissmuller who retired after 16 years. Lex went on to make five Tarzan films before he too moved on. This role however is the one for which Lex Barker is best known – even though it only accounted for about 4 years of his film acting career. 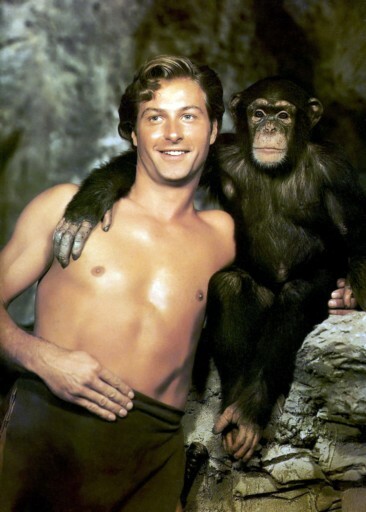 Tarzan’s Magic Fountain was Lex Barker’s first Tarzan film — producer Sol Lesser interviewed more than 1,000 actors to replace Johnny Weissmuller in the role of Tarzan. Lex Barker turned out to be one of the better film Tarzans, even though Johnny Weissmuller was obviously a hard act to follow. The film is about a tribe of people hidden deep in the jungle. In their secret valley is a fountain of youth, which keeps a woman who crash landed in the jungle decades ago looking as young as she was when her plane went down. After she had returned to the outside world, word of the fountain leaked out and unscrupulous hunters try to find and exploit it. Tarzan tries to keep the hunters from finding the hidden valley of the fountain. The flyer ages as the effects of the fountain wear off — a theme originally used in James Hilton’s wonderful film Lost Horizon years earlier. Elmo Lincoln, the original Tarzan from 1918′s Tarzan of the Apes has a cameo role as a fisherman in this film. Brenda Joyce plays Jane in the film and became the only actress to play the part with two different Tarzans – she had made 4 films with Johnny Weissmuller – although after a reasonably long career in films , she packed it in after Tarzans Magic Fountain with Lex Barker and left acting for good. Away from the jungle sets at MGM Brenda Joyce admitted that she did not like playing Jane and she was upset by Johnny Weissmuller’s persistent sexual harassment. She once told one of her friends “How Johnny holds all that manhood tamed under his loincloths defies the laws of nature.” . She was once certified as having the longest hair in Hollywood – 39 inches – outranking Katharine Hepburn and Veronica Lake. Born Betty Graffina Leabo at Excelsior Springs, Missouri in 1912, she was educated at San Bernardino and Los Angeles High Schools and much later 20th Century Fox spotted her in a fashion magazine layout. She was signed to a two-picture contract. but first 20th Century Fox changed her name to Brenda Joyce. She made her screen debut as Fern Simon, the second lead in the Oscar-winning earthquake epic The Rains Came (1939) with Tyrone Power and Myrna Loy. The role won her good reviews and after Here I Am a Stranger (also 1939), about a young Englishman (Richard Greene) in search of his alcoholic father (Richard Dix), Brenda Joyce was signed indefinitely. Her off-screen interests included gardening (she was one of Hollywood’s best horticulturists) and art. She later married Owen Ward, an Army officer. For this the studio punished her by relegating her to a string of B-pictures. Following this and a bit of cooling off time ahe came back as a second-feature star at Universal and RKO and later more notable roles saw her star opposite Lon Chaney Jr and Gale Sondergaard in such B-chillers as Pillow of Death (1945) and The Spider Woman Strikes Back (1946 Co-starring with Brenda Joyce is Rondo Hatton (April 22, 1894 – February 2, 1946) – he was an actor who had a brief, but prolific career playing thuggish bit parts in many Hollywood B-movies. He was known for his brutish facial features which were the result of acromegaly a disorder of the pituitary gland. Acromegaly distorted the shape of Hatton’s head, face, and extremities in a gradual but consistent process. Hatton apparently in his younger days had been voted the handsomest boy in his class at High School but he eventually became severely disfigured by the disease. Because the symptoms developed in adulthood, the disfigurement was incorrectly attributed later by film studio publicity departments to his exposure to a German mustard gas attack during service in World War I. Universal Studioss attempted to exploit Hatton’s unusual features to promote him as a horror star after he played the part of the Hoxton Creeper alongside Basil Rathbone as Sherlock Holmes in The Pearl of Death (1944). He made a half dozen minor films playing variations of the Creeper character, including The Brute Man (1946). Hatton died of a heart attack in 1946. I always felt so sorry for Rondo Hatton who was billed as The Screens Ugliest Man and yet off screen known by his family as one of the nicest kindest men you could hope to meet. Two children later, Brenda Joyce seemed to have lost interest in her film career, but was coaxed back to the film set by the producer Sol Lesser after Maureen O’Sullivan had left the Tarzan series and Weissmuller approved the athletic beauty as his new blonde jungle mate. Tarzan and the Amazons was followed by Tarzan and the Leopard Woman (1946), Tarzan and the Huntress (1947) and Tarzan and the Mermaids (1948). After Weissmuller hung up his loin cloth, she played Jane for one last time, opposite Lex Barker in Tarzan’s Magic Fountain (1949) – making her the only Jane to co-star with two different Tarzans – before quitting show business forever. Between the Tarzan movies, Joyce made several B films for Universal, two with Lon Chaney Jr, Strange Confession and Pillow of Death (both 1945), The Spider Woman Strikes Back (1946), pitted against Gale Sondergaard in the title role; and Little Giant (1946), with Bud Abbott and Lou Costello, playing it straighter than usual as a foil to the comedians. After a painful divorce in 1949, she retired into obscurity, working for a decade (under her real name) in Washington for the department of immigration. She also kept her famous past in films from staff at the nursing home in Santa Monica where she spent her final years. However she was visited there by actor Johnny Sheffield who played Boy alongside her in the Johnny Weissmuller Tarzan films. She is survived by her three children. 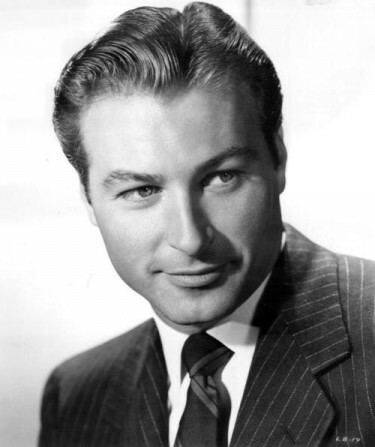 Lex Barker collapsed and died whilst walking along the street in New York in May 1973 at the age of 54. Lex Barker was a direct descendant of the founder of Rhode Island, Roger Williams, and of Sir ‘William Henry Crichlow’, historical governor-general of Barbados. He excelled in football and track at Fessenden School and Phillips-Exeter Academy. He went to Princeton but left to become an actor. A year later he was spotted in summer stock and received a contract offer from 20th Century-Fox. Then came World War II and he enlisted as an Infantry Private and rose to the rank of Major. Signed initially by Fox and then Warner, he was too tall for supporting parts and too unknown for leads. Tarzan’s Magic Fountain (1949) (RKO) provided his first starring role. After five Tarzans he went into other adventure films. 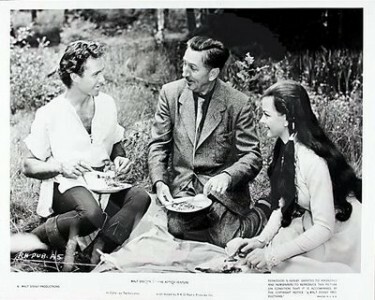 After 16 non-Tarzan films, mostly westerns, he went to Europe in 1957 . He went on to make more than 50 films all over the world. Must admit that I think Tarzans Magic Fountain was released in 1949 so technically doesn’t qualify as a ‘films of the fifties’ but maybe it came to England in 1950 – I will pretend it did !!! 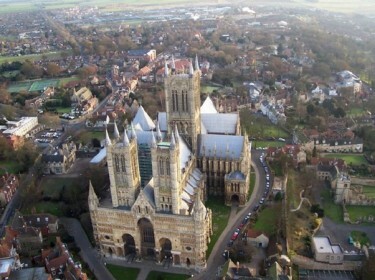 Earlier I posted a subject on The Dam Busters which included a terrific shot of Lincoln Cathedral from the air. In the film The Dam Busters there is a sequence where we see the Lancaster Bombers fly over Lincoln. Just down the road is the wonderful Lincolnshire Aviation Heritage Centre. I WOULD VERY MUCH RECOMMEND ANY READERS HERE TO VISIT. If you can’t make it however click on this link below and you will be taken there. You will see the only airfield in the world where you can see a Lancaster Bomber taxi on the runway – Thrilling !!! The Lincolnshire Aviation Heritage Centre is a privately owned and run Museum and was set up by two farming brothers, Fred and Harold Panton. It has been built up as a memorial to Bomber Command and primarily as a tribute to their eldest brot her Christopher Whitton Panton; who was shot down and killed on a bombing raid over Nuremberg on 30/31 March 1944. For a short time after the war there was interest from the brothers to visit Christopher’s grave in Germany, but their father denied them the chance as he wanted ‘nothing more to do with the war’. Until, in the 1970′s Mr Panton called Fred over and told him to ‘get off to Germany and bring me a photograph of Chrisy’s grave’ which of course Fred did as soon as he could. This reignited Fred’s interest in the War and when NX611 came up for sale it was eventually purchased by the brothers and brought to their land at East Kirkby. Even though they had planned to keep it only for their private collection it was suggested that they should make it into an exhibit for the public and this Museum was set up with the Lancaster and Control tower as its centre pieces. The Lincolnshire Aviation Heritage Centre was then opened in 1988 and has hosted visits from many famous people both from the aviation and show-biz worlds. We are all extremely proud of the accomplishments of the Centre, one of the biggest independent museums receiving no funding or Lottery grants. We can only hope that we will be able to continue to educate the following generations to the sacrifices and roles of Bomber Command. Only a few miles away is the Battle of Britain Memorial Flight at RAF Coninsby again in famous Lincolnshire. Above Picture is of the City of Lincoln PA474 which was transferred to the Battle of Britain Memorial Flight in 1973. This is not the Lancaster at the Heritage Museum though. In 1975 a mid-upper turret was found in Argentina and fitted. The City of Lincoln now wears the KC-A markings from the 617 Dambusters squadron and wears the Thumper MKiii nose art, originally painted by Flt Lt Bob Knights upon posting to the 617 squadron . She displays the markings of bombs for operations over Germany, ice-cream cones for operations over Italy, and poppies for when she has released poppies during exhibition flights. She had appeared in two films- Operation Crossbow and The Guns of Navarone. 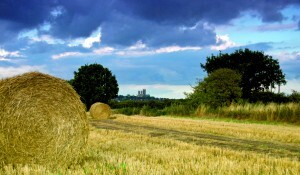 Lincolnshire Countryside with Lincoln Cathedral in the distance.